Green Lantern #20: Have We Seen That Hooded Figure Before? Warning: There are spoilers ahead for Green Lantern #20, Geoff Johns's final issue on the series, currently on sale. Geoff Johns's final, monthly Green Lantern comic--the issue just released yesterday, in which the various Lantern Corps face off against Volthoom and the final fate of Hal Jordan is revealed--features an interesting, mostly-anonymous character...but one that was quickly recognizable if you were looking at it in the right light. "...Sinestro," wearing a similar hooded, caped uniform to the one we saw him in when he was recruited by the Guardians to fight against a rebelling Hal Jordan during Emerald Twilight. Not with the exact same color scheme, mind you, but in other issues (either the previous one or in flashbacks), it may have been recolored to more closely resemble what we see here, because the moment I saw the image above, I was reminded of his surprise appearance at the end of Green Lantern #49 in 1993. 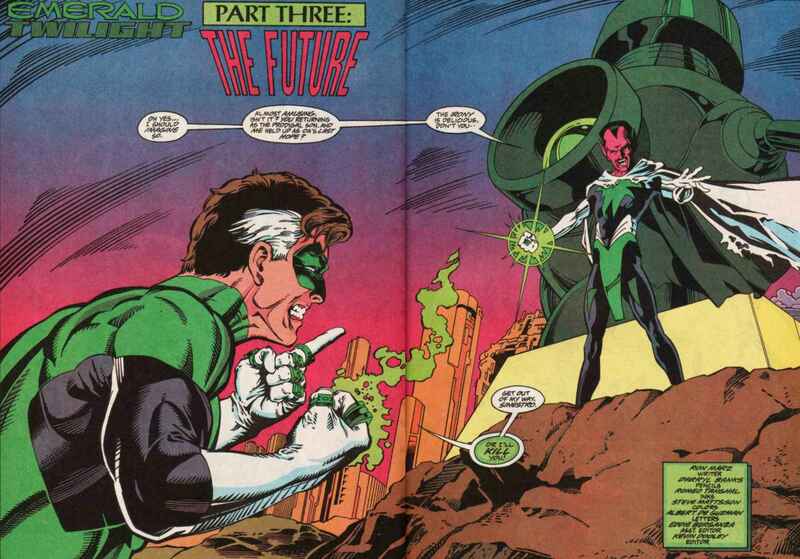 It's interesting to think that he could be wearing a uniform quite like this short-lived one in his latter days--and that Johns revisited the look considering that both Hal and Sinestro have come so far since then, but that Emerald Twilight was such an integral part of what made Johns's run tick. 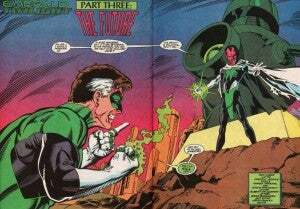 Addendum: The image at right, showing Hal Jordan's cape when he was Parallax, more closely resembles the one being worn by Sinestro when he's hooded. Perhaps my brain made a free association because of Sinestro's connection to Parallax in GL #20.